BabyWorld : Is co-sleeping benefic or not? Will you ever sleep in your bed or in your own room? This is the question I ask my 6 year old daughter every day. She's been sleeping in bed with me or her daddy since her 1st year of age. And my second daughter does the same. And I don't regret it at all. Because when I look at them, I see two peaceful little angels, full of joy and with no frustrations, no fears, no nightmares. Most of people say that this is wrong, that the children will be spoiled or with a wrong behavior towards everything, or they won't be self-dependent at all. Will they sleep with her mom or dad until the age of 18? Of course not. They will need space at some point, so, like every other issues that come into our lives and simply go away at a moment, our children will become more and more self-dependent. Of course our role is to help our children become the adults they want to be, and to guide them in life to be good people from any point of view. Co-sleeping means sleeping in the same room or same bed with your child. According to James J. McKenna Ph.D. and Edmund P. Joyce C.S.C. Chair in AnthropologyDirector, Mother-Baby Behavioral Sleep Laboratory University of Notre Dame and Author of Sleeping with Your Baby: A Parent’s Guide to Cosleeping "the term cosleeping refers to any situation in which a committed adult caregiver, usually the mother, sleeps within close enough proximity to her infant so that each, the mother and infant, can respond to each other’s sensory signals and cues. Room sharing is a form of cosleeping, always considered safe and always considered protective. But it is not the room itself that it is protective. It is what goes on between the mother (or father) and the infant that is. Medical authorities seem to forget this fact. This form of cosleeping is not controversial and is recommended by all." They also say that "roomsharing is a form of cosleeping and this form of cosleeping (as at least three epidemiological studies show) reduce an infant’s chances of dying by one half." I shared bedroom with my two daughters when they were new born. First of all, because it was safer and easier for all of us, and breastfeeding was the main reason I did it. It was easier for us to sleep better, I could better watch the babies over the night, and I felt more protective to share the bedroom with them. 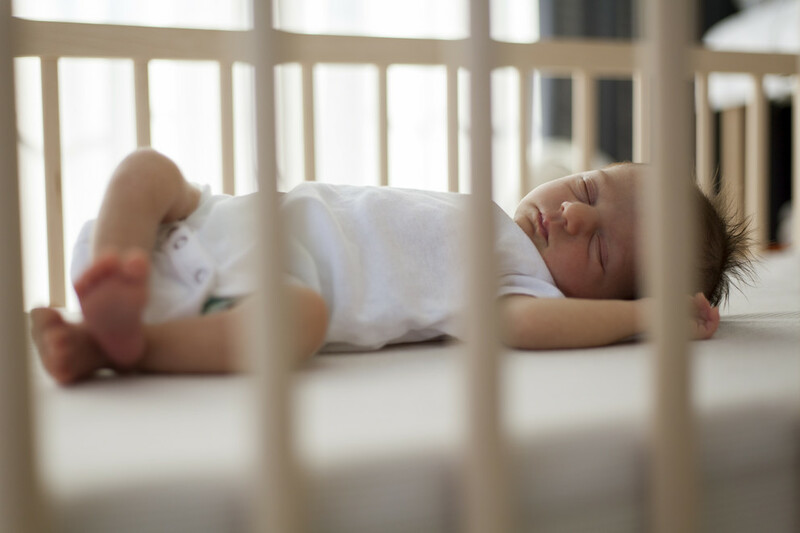 In the first months of life it is important for the babies to sleep in their cribs, not in bed with their parents, to avoid the newborn dying from SIDS (when parents have a deep sleeping or they use drugs, alcohol or any other meds that could influence their mental health), although mother-infant cosleeping saves infants lives and contributes to infant and maternal health and well being, according to researchers. This is ok when talking about responsible, healthy and conscious parents, because cosleeping could be dangerous when talking about parents who take drugs, drink alcohol or smoke in the same room with their babies. Bed sharing is sometimes argued about as a wrong thing, and there are pro and contra opinions about it.It's not dangerous at all for older infants and toddlers, especially if you create a safe space for them. They need affection and comfort, and, moreover, they need to feel connected especially with their mothers. As the researchers mentioned above said, "the adults should not bedshare if inebriated or if desensitized by drugs, or overly exhausted, and other toddlers or children should never be in a bed with an infant. Moreover, since having smoked during a pregnancy diminishes the capacities of infants to arouse to protect their breathing, smoking mothers should have their infants sleep alongside them on a different surface but not in the same bed." If practiced safely, bedsharing is extremely important for the babies, especially after their first months, when mothers and babies have already known eachother, and breastfeeding contributed not only to their physical but to their spiritual approach, too. The researchers say that in any way, babies are exposed to certain risks. They say that "just as unsafe cribs and unsafe ways to use cribs can be eliminated so, too, can parents be educated to minimize bedsharing risks....In Japan where co-sleeping and breastfeeding (in the absence of maternal smoking) is the cultural norm, rates of the sudden infant death syndrome are the lowest in the world. For breastfeeding mothers, bedsharing makes breastfeeding much easier to manage and practically doubles the amount of breastfeeding sessions while permitting both mothers and infants to spend more time asleep." I admit that my babies have been sleeping in their cribs for several months since their birth, but, in time, they needed more and more affection. They've started to feel unsafe over the night, and I've been walking several times between our rooms over the night, because of this, and because of breastfeeding (breastfeeding in my second child lasted 2 years). So, we've continued to co-sleep in the same bed until the present time, and I see the happiness on their faces when sleeping, I see them peaceful and careless, and, most of all, I feel happy when they still need me to hug them. What could be more peaceful than that? If a child feels more comfortable this way, than parents should think and take into consideration their emotional state. As a conclusion, there are risks anyway: if a mother agrees with co-sleeping, than she feels she's responsible enough and ensures the safety of her child at every moment. A mother knows better according to her child's physical and emotional needs. On the other hand, if a baby sleeps alone in his bed or room, he could be exposed to certain risks that involve his health. So, at every corner we meet risks, and it depends on us how we approach all the situations.